Beautifully engraved Certificate from the Public Utility District No.1 of Chelan County issued in 1958. This historic document was printed by the American Banknote Company and has an ornate border around it with a vignette of the Rocky Reach Hydro Electric System in Chelan county. This item is hand signed by the company's President and is over 56 years old. In 1999, Columbia River System flows were 23 percent above those of 1998 and 121 percent of normal. This reflected a higher snowpack from previous years. The runoff pattern and resulting streamflows for the upper Columbia River, as measured at the Rocky Reach Hydro Project, averaged 139,300 cubic feet per second; the 20-year average is 115,800 cubic feet per second. The District received a preliminary permit for the Project from the Federal Power Commission (FPC) on August 10, 1954. An application to construct and operate the dam was filed with the same agency on January 13, 1956. The Federal Power Commission issued a license to build the Project six months later, on July 12, 1956. Construction of the dam and original powerhouse began on October 2, 1956 under the supervision of the District's engineering design firm, Stone and Webster Engineering Corporation. The immediate task was the installation of cofferdams to seal off the area designated for the spillway from the river flow during low water. Following spillway construction, the powerhouse was built. A total of 3.3 million cubic yards of dirt and rock were moved during the five-year initial construction. Employment peaked at 2,184 in July 1959. The initial seven generating units were placed in commercial operation on November 1, 1961, six months ahead of schedule. On September 1, 1966, the District filed an application with the Federal Power Commission to amend the Project License to add four generating units. The FPC issued the license amendment May 23, 1968. The second phase of construction began April 22, 1969, and was completed December 1, 1971. The expansion work increased the power plant's generating capability by 60%, from 815,000 kilowatts to 1.287 million kilowatts. The Project was financed through the sale of the above shown revenue bonds. A revenue bond is a pledge of future revenues generated by the project to repay debt. No tax money was used. The original project, which cost $273.1 million, was financed with a $23.1 million bond issue completed in November 1956 to allow for an early construction start. It was followed by a completion bond issue of $250 million in January 1958. Repayment of the revenue bonds is guaranteed through power sales contracts between the Chelan County Public Utility District and the purchasers of Rocky Reach power: PacifiCorp, Portland General Electric Company, Puget Sound Energy, Avista Corp., the Aluminum Company of America (ALCOA) which has a plant just south of Wenatchee, and the District's Electric Distribution System. Each of the contracts covers a period extending 50 years after the November 1961 starting date of commercial operation for the initial seven generating units, or until final payment is made on the $273 million in bonds sold for the initial phase of the Project, whichever is longer. The contracts expire in November 2011. 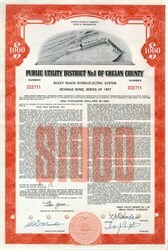 The original Project License was issued July 11, 1957 by the Federal Power Commission. The license expires in 2006. Prior to that, the District will be required to submit an application for renewal. TURBINES The hydraulic turbines consist of huge water wheels that resemble ship propellers. They are turned by the water flow and connected to the electricity-producing generators by large steel shafts. The original seven units at the Rocky Reach Project are equipped with adjustable blade Kaplan turbines, fabricated by the Allis-Chalmers Manufacturing Company. They're each rated at 140,000 horsepower. Their design allows the turbines to maintain maximum operating capacity and efficiency despite variations in the river flow and generator output. The four newer units contain fixed blade turbines. They were manufactured by Dominion Engineering and are rated at 177,000 horsepower each. The average hydraulic head on the turbines is 92 feet. In the Allis-Chalmers turbines, each runner is over 23 feet in diameter and weighs 172 tons. Each of the six blades weighs more than 11 tons. The connecting shaft, which drives the generator, is 47 inches in diameter, 27 feet long, weighs 100 tons and turns at a speed of 90 revolutions per minute. The Dominion Engineering runners are each constructed of steel 26 feet in diameter and weigh 150 tons. These runners feature five fixed-position blades. The connecting shaft is 50 inches in diameter, 28 feet long, weighs 105 tons and turns at a speed of 85 revolutions per minute. In 1995, the District began replacing the adjustable-blade Kaplan turbine runners for Generating Units 1-7, and began installing new Kaplan turbines and governors in Units 8-11. Normal wear and tear had caused some blades to crack. In addition, new turbine runner design is making the units more "fish friendly." The project is scheduled for completion in 2001. SPILLWAY GATES The crest of the reservoir can be regulated by 12 spillway gates, which open individually and allow water to pass through separate spillway bays. The gates pass water seasonally that is surplus to power generation needs, or as required for assisting fish in their downstream migration. Each of the 170-ton spillway gates are secured to the concrete structure by 24 steel anchor bolts that are 50 feet long, 6 inches in diameter and individually weigh more than two tons. The spillway is capable of passing up to 1.2 million cubic feet per second of water. The District recently began analyzing the spillway gates, their lifting mechanisms and their bearings to ensure compliance with the most current regulatory requirements. TRANSMISSION Power from the Rocky Reach Project flows to a single major distribution point which is the Rocky Reach Switchyard, located on the east bank of the Project. From the switchyard, power is delivered to the District's Distribution System at 115,000 volts. Other 230,000-volt transmission lines deliver energy to the Project's power purchasers, who collectively serve approximately 7 million customers in the Pacific Northwest. Power also flows into the regional grid of the Bonneville Power Administration. Much of the information on the history was obatined from the Chelan County Public Utility District's website at http://www.chelanpud.org/.